as is section at Ikea. adventure for $1.50 for four. from Goodwill at .25 each! Cost Pus World Market find. They have fish and dolphins on them. 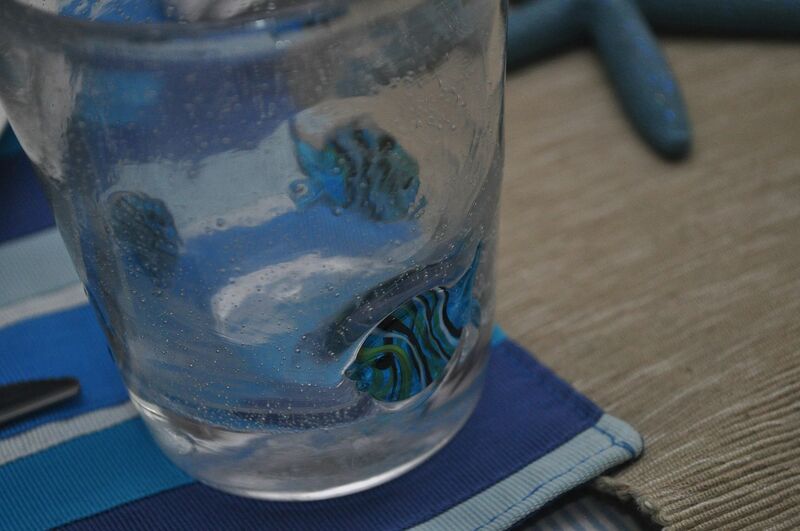 And yes, they are glass, not plastic! star fish on the twine. 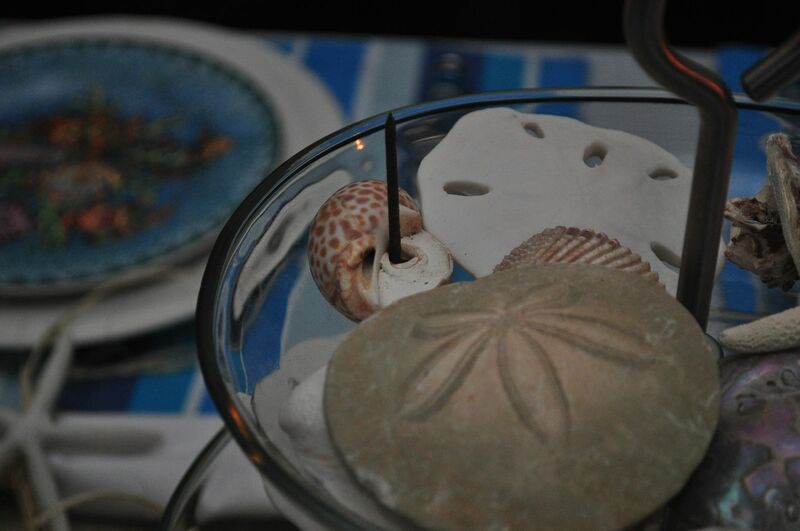 with shells, sand dollars and starfish. and were on clearance at Pier 1. This is my favorite shell! Look how it grew around a nail! I'd love to be able to take Mr. B there someday. 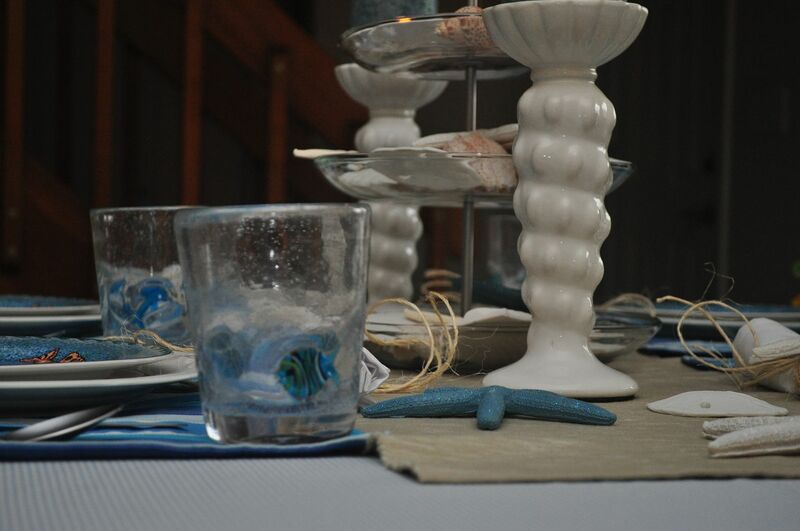 Kathe, another beautiful tablescape put together with thrifty finds and a little know-how! The name is Perfect Mr. B!!!! Maui Wowie is sure a WOWZERS!! I want to kick my sandals off and enjoy some time there with you all! Looks great Kathe! Such a fun table..gosh your good! Aawwwww, Kathe.....that's so sweet. Your hubby is contributing! :-) That shell that grew around the nail is really cool! I have never seen anything like that before. I guess I don't ever really think about how shells had living things in them at one time and that it's entirely possible to do something like that! You did a great, great job on the napkin embellishments!!! Don't mess with a girl and her hot glue gun! :-) I saw that flatware at World Market when I was in browsing around a couple of weeks ago and really wanted to buy it. Debbie at Words on Wheels and I were on a buying hiatus, though, so I left them there. Sigh! I love the glassware. It looks kinda 3-D! Great table, but I don't see any candlewick, just kidding. Wow !!! Outstandin, I can almost hear the waves in the background. Great job of putting it together. Very island-y, and I love the blue water theme throughout. Perfect! I would be happy to go to Maui in January. I love your tablescape. Makes me long for the beach!! I hear you, someday.... Love all of the details of your table, so fun and festive! 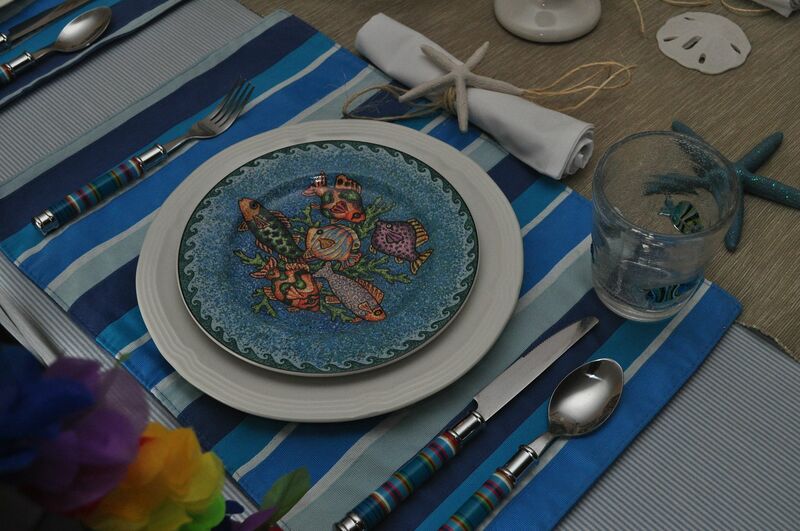 What a pretty table...♥♥♥ those fish plates. Yes, I want to go to Maui!! It's on my bucket list, hopefully one day. In the meantime, I love your tablescape! 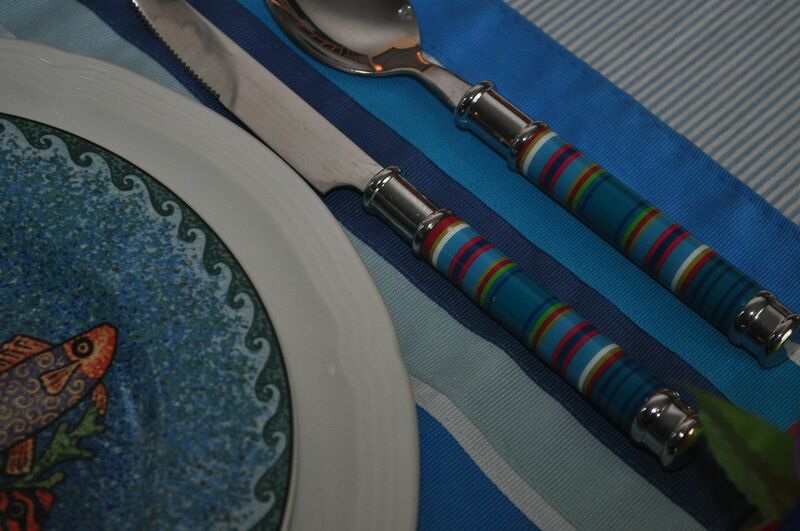 I really like that flatware! Using the three tiered serving dish for height and shell display is a great idea. I also have been in the beach mood this summer. 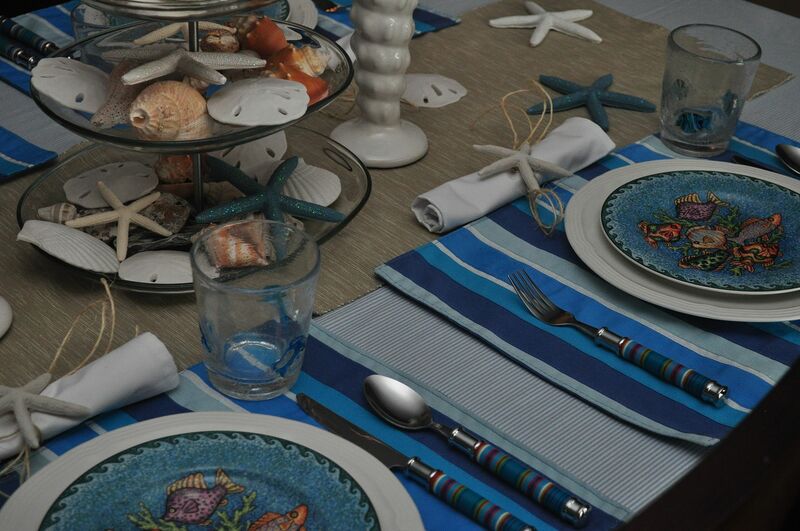 Even when landlocked a oceany tablescape is able to tale you away. Your table is very pretty and certainly makes me wish for some time in HI! You have some fabulous thrify finds featured. Thanks for sharing. Visiting from Between Naps on the Porch. Hi Kathe: This is just a gorgeous tablescape! I love the blues and tans, and really like that you got a lot of it on sale or thrifting--those are my favorite ways to shop, too! Well done! This looks great!! !I am visiting form the Glimpse inside linky and am your newest follower! I blog over at http://www.garagesalesrus.blogspot.com/ I hope you will stop by and do the same! I also have an awesome giveaway going on right now with a Cricut Machine. I would love it if you would enter! It ends tomorrow though! Hope you have a great day! What a fun tablescape! All of your items came together so perfectly and what great deals too! 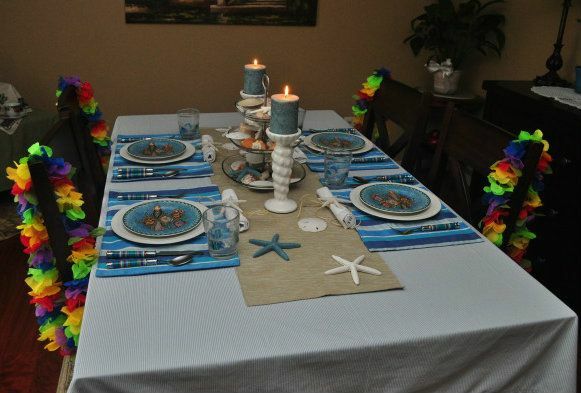 What a beautiful Maui summer tablescape Kathe. 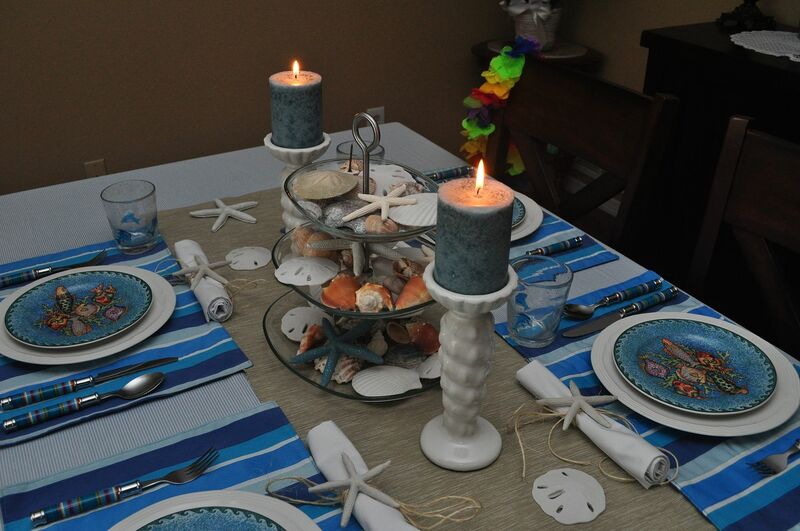 To start with, you really scored some great deals, plus everything looks just perfect with the right elements for making this awesome beach table. Visiting from Shine on Fridays. Nice!! Some great buys!! Hope you and Mr. B. get to enjoy Maui, I hope to share that experience with my hubby some day, until then I will live it vicariously through you!! That's cute...Maui Wowie...what a sweet husband. He's right too. I love the tiered center piece with the gorgeous shells! Beautiful! I'm still loving everything beachy and this is right up my alley! Nice job and I love that tiered centerpiece! 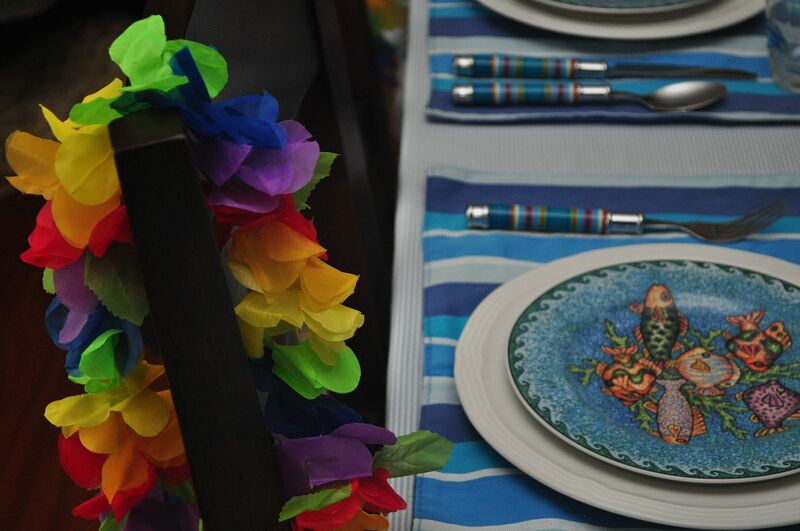 Maui is wonderful and so is your tablescape. 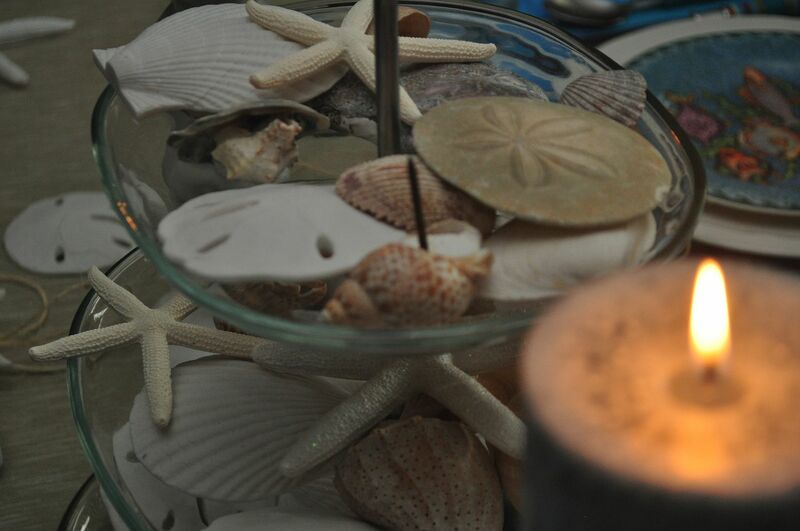 I've been decorating the house for summer this year with all my beachy things I've collected through the years. And I love it! 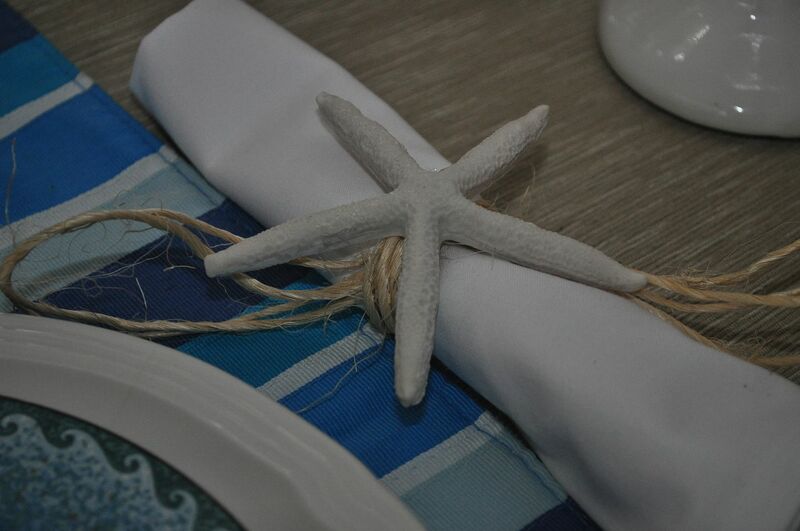 My favorites here are the fishy plates and those starfish napkin rings - LOVE! And I am loving your new blog design, too!!! Another amazing tablescape. I can hear the waves lapping at the shore in the background. What a beautiful island dining experience you created. Well done! Sweet! I love it. I am amazed at how creative people can be. Me, not so much. I'm more of a copier than a creator. That looks so lovely. Very beautiful! I love coastal design so of course I love your table. Beautiful! Love it!...I've been blessed to travel to Maui,and this sure reminds me of all the wonderfulness...I'm visiting from Boogieboard Cottage!! I'm going to have to start calling you the vignette queen! Your tablescapes are always so very pretty. do you rent your services out! The coastal design is so very pretty! Beautiful as always! So glad you shared your creative inspiration with Sunday’s Best – your creativity helped make the party a success! I can hear the hula music! What great finds! 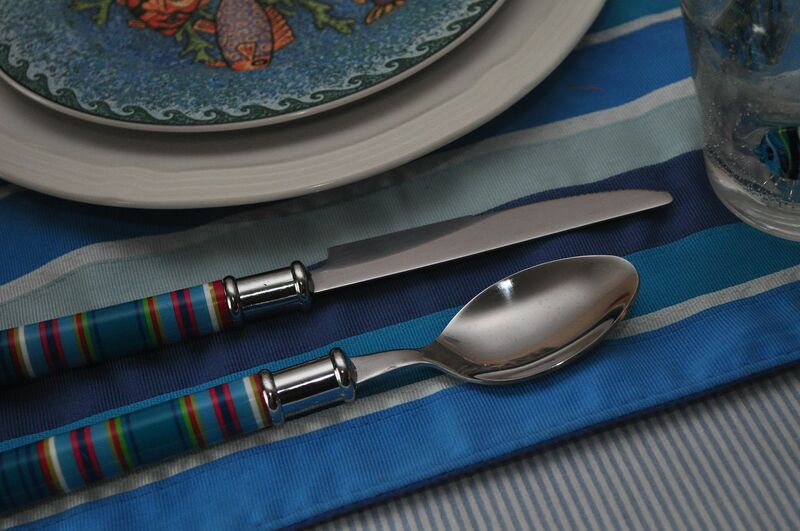 The flatware is wonderful! Goes so well with the mats! Thanks for linking your maui table to Let's Dish! Stopped by from Sunny Simple - your table looks beautiful! Great table Kathe! And wow, what wonderful bargains! I can't believe you got that flatware for such a amazing price. Thank you for sharing at TTF and have a terrific day! WOW This is so elegant yet fun! 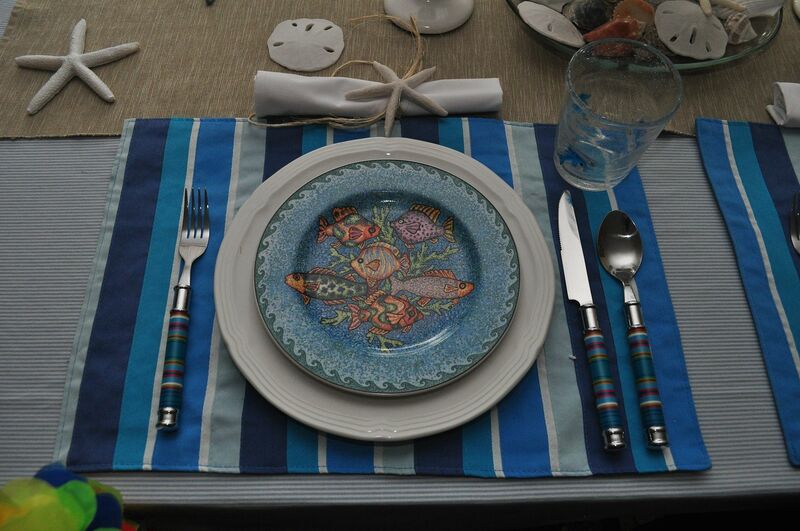 Your tablescape looks great and I love, love, love those salad plates! Very pretty! I adore your starfish the most! Thanks for linking up this week! I'm co-hosting with Marvelous Monday - great tablescape... I was so sad when World Market pulled out of Minnesota - loved that place!! I love the flatware! Wonderful table! 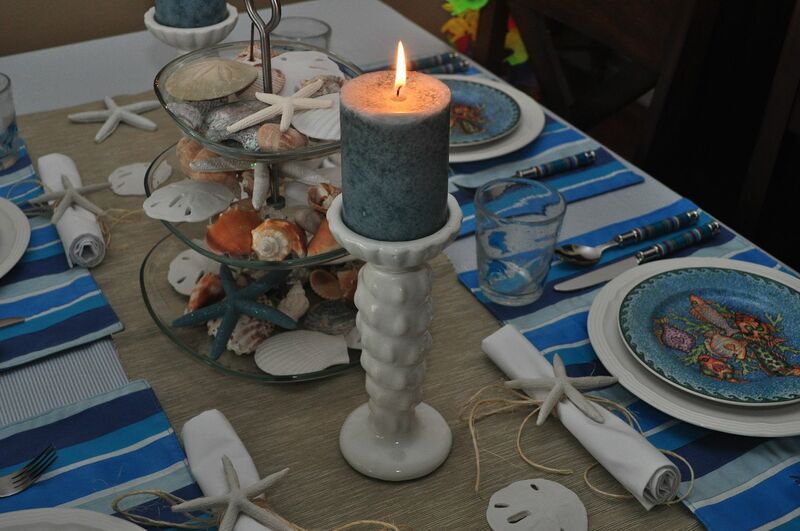 Thanks so much for sharing this beautiful Maui tablescape on Simple & Sweet Fridays. So pretty! Beautiful! I have never been to Maui but I feel like I'm just a little bit closer as I look at this gorgeous tablescape! It's nice to have a staycation when you can't have a vacation! Thanks for sharing at Gettin' Krafty With It this week! That is so gorgeous and beachy! I love the starfish. It's a lovely tablescape. I love those fishy glasses! Thanks for linking up at What’s Cluckin! Hope to see you back tomorrow! Everything looks great. Thanks for sharing at the All Star Block Party. Absolutely beautiful! Thanks so much for linking this up to our Weekend Wonders link party. Hope to see you again Thursday. I love this table also. Thank you so much for sharing with Wednesdays Adorned From Above Link Party. Hello Kathy, That's a fantastic name for this festive tablescape! You found some lovely things for great prices! Love it! So fun! I heart all things beachy! So glad you linked up at Shine on Fridays this past week! I LOVE this table Kathe!! So bright and summery! and those glasses are fabulous! 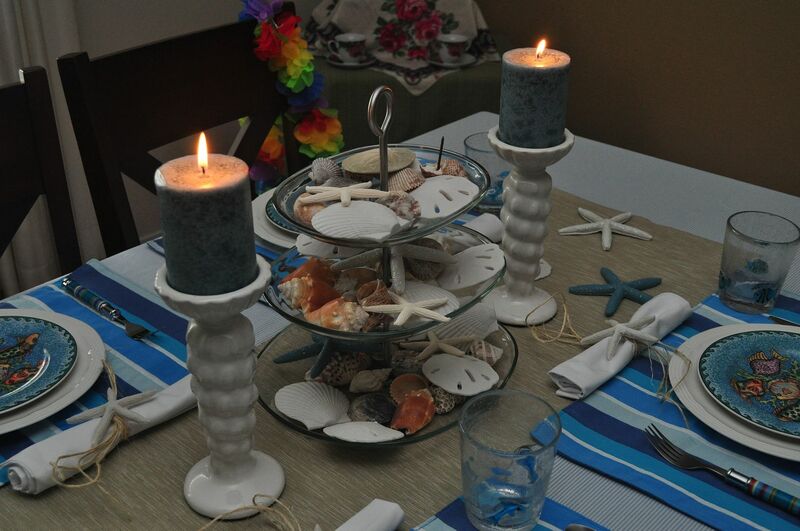 I love beachy themes so I love this table setting. It looks great! Thanks for sharing on Marvelous Mondays! Very pretty! Thanks for joining me at Home Sweet Home! Such a fun tablescape Kathe!! You must show we where you store all this great stuff! Wow! Kathe.. this looks totally A-mazing! Who wouldn't want to come to your house for a fun and festive party? You should be a party planner! Very pretty! I would love to go to Maui sometime. Maybe someday. :) Thanks for sharing at I Made It! Monday. Can't wait to see what you link up this week. What a beautiful table! I love those glasses. Thanks for sharing on Tout It Tuesday. Hope to see you tomorrow. I bet you had a lot of fun - both with your friends and putting it all together. I love that you got each item for so little - now that's inspiring! How fun. I'm sure Mr. Be loves to see what you come up with each time! This table setting is awesome! I agree with your husband's response. I am featuring it this week on Dare to Share.